Famous for its beer, chocolates and the Tin Tin Trail, Belgium is a small yet enchanting country to visit during your travels around Western Europe. Bordering France, Luxembourg, Germany and Netherlands, opting for a car rental to and from Belgium is a great way to add another fascinating country into your itinerary. With the maximum driving distance not exceeding 300 km, Belgium is a charming little country to explore by road within a few days. It is extremely easy to get from one city to another within a few hours, allowing you to pace out your journey making some unconventional stops along the countryside. When you opt for a car rental in Belgium, consider choosing Brussels as your start point before you take off to explore Antwerp, Burgge, Ghent, Namur and Leuven. Each one of these cities can be explored in a single day by driving back and forth. Hertz o provides you with a navigation system that makes your journey a safe one. 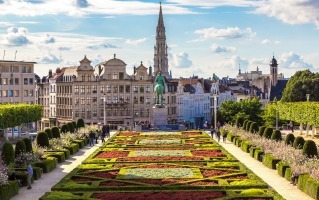 · Brussels – The unofficial capital of the EU, here you will get to see the Grand Palace, the Gothic town hall and baroque guild halls during your stay. · Antwerp – The second largest city in the country, it is home to a Gothic cathedral of Our Lady and is famous for its fashion, and diamonds. · Bruges – Nicknamed the Venice of the North, Bruges offers a rather romantic atmosphere with its canals and medieval setting. Book a car with Hertz, pay online or during pick-up, and head towards exploring the gorgeous country of Belgium.